Macka B, is a British reggae artist, performer and activist with a career spanning thirty years in the United Kingdom and Jamaica. 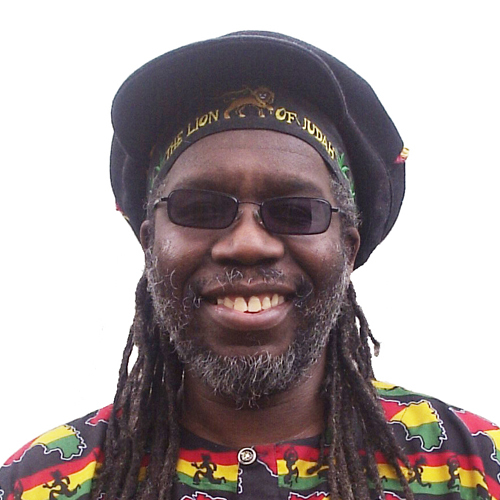 Macka B's music is based around the political and spiritual message of Rastafarianism, often with a light and humorous touch. Macka B follows the ital diet, and is a patron of The Vegan Society. He takes his name from the Judean rebels against the Greeks, the Maccabees. Born in Wolverhampton, UK to Jamaican parents Macka B became interested in music in early childhood. He played violin and sang in the school choir. He first heard reggae from a blues party next to his parents home. Immediately the vibrant reggae beat found a place in his heart. Soon he was getting inspiration from listening to such greats as Burning Spear, Bob Marley, Peter Tosh, Count Ossie, to name but a few. A 1982 visit to Jamaica inspired him greatly and the following year he entered a DJ competition and won. He was invited back on radio and his name began to spread. Influenced by Jamaican toasters U-Roy, I-Roy, Big Youth and especially Prince Far I and later work with the Mad Professor, Macka B combined dancehall and dub styles and began recording in 1986. His first release Sign of the Times went to the top of the UK reggae album charts followed by television exposure. Albums followed every year thereafter. Macka B won British Best Male DJ awards in 1991 and 1992 He released successive recordings and toured internationally, alone and with other reggae stars such as Burning Spear, U-Roy, The Wailers and Lee Perry. He twice performed on Reggae Sunsplash and also at Sting & White River Reggae Bash in Jamaica. He appeared in front of Nelson Mandela in the National Stadium Kingston. Macka.B has toured Japan, North America, Africa, Hawaii, France, Germany, Belgium, Sweden, New Zealand, Australia, Italy, Spain and Poland. He was the first British Reggae artist to tour the former Yugoslavia (Slovenia, Croatia, Serbia) and Australia. He performed in Senegal alongside Baba Maal and also in Sierra Leone and has shared the stage with artists such as Burning Spear, U-Roy, The Wailers, Kool and the Gang, Lee Perry, Culture and the Gladiators. 2015 Macka.B Released �€œNever Played A 45 which is being hailed as his best album to date. The title track was first released on 7inch 45 vinyl in 2012 and became an anthem. In 2016 Macka.B embarked on his Never Played A 45 Asia Tour visiting countries like the Philippines, Vietnam, Thailand, China, Hong Kong and Japan. 2017 -2018 saw extensive touring in Europe (UK, Germany, Italy, Luxembourg, Romania) as well as Australia and a slot at the Sierra Nevada World Music Fest in the US. True to his ideals, Macka.B continues to tour the world extensively setting a positive example, breaking down the barriers and spreading consciousness. If you've ever wanted to find out more about cucumber (for example, that it's 95.2 percent water), or pomegranate (bet you didn't know it's an aphrodisiac), then look no further.